The most important factor to consider when selling your home is determining the right price. Your Signature Premier Properties agent will provide you with accurate and current market data to position your home properly to stand out from the competition and to net you the most money in today’s real estate market. Your Signature Premier Properties agent is a local specialist that will help you get top-dollar for your home. Our professionals go through extensive training to be the best possible real estate agents in the marketplace. Our continued success of “fewest days on the market” for our clients is a testament to our dedication and commitment to selling your home. You never have a second chance to make a first impression. No matter how good the interior of your home looks, buyers have already judged your home before they walk through the door. It’s important to make people feel warm, welcome, and safe as they approach the house. Spruce up your home’s exterior with inexpensive shrubs and brightly colored flowers. Your house needs to be “show-ready” at all times – you never know when your buyer is going to walk through the door. You have to make yourself available when buyers want to preview your home and it has to be in tip-top shape. Don’t leave dishes in the sink, make all of the beds, keep the bathroom sparkling, and make sure there are no dust bunnies in the corners. It’s a little inconvenient, but it will help your house sell faster. One of the most important things to do when selling your house is to de-personalize it. The more personal items in your house, the less potential buyers can imagine themselves living there. This includes family photos, memorabilia collections, and personal keepsakes. Put as much as you can in storage. Quick fixes before selling always pay off. Instead of a mammoth makeover, get a new fresh coat of paint on the walls. Clean the curtains or go buy some inexpensive new ones. Replace door handles and cabinet hardware, make sure closet doors are on track, fix leaky faucets, and clean the grout. Nice kitchens are at the top of the buyers wish list. If you don’t have a completely updated kitchen there are inexpensive ways to spruce it up. If the counters are completely out-dated but the cabinets still look good, then change the counter tops. If your budget is tight, little things like changing the hardware or a nice fresh and neutral paint job would certainly do the trick. Do you have one appliance that doesn’t match and truly stands out? Replace it, you don’t want to give buyers anything negative to talk about. Maximize the light in your home. 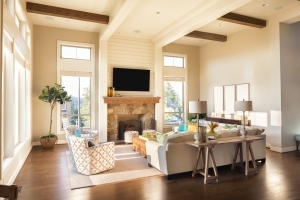 After location, good natural light is the one thing that every buyer cites they want in a home. Take down the drapes, clean the windows, and cut the bushes outside to let in sunshine. Do what you have to, to make your house bright and cheery – it will make it more sellable. You might think a cuddly dog would warm the hearts of potential buyers, but you might be wrong. Not everyone is a dog or cat lover. Buyers don’t want to walk in your home and see a bowl full of dog food, smell the kitty litter box, or have pet hair stuck to their clothes. It will give buyers the impression that your house is not clean. Focus on your home and not your pets. Storage is something every buyer is looking for and can never have enough of. Take half of the items out of your closets then keep everything neatly organized. Be sure to keep all of your closets and cabinets clean and tidy.